 The Al-Maktoum College of Higher Education three-day “Building Bridges” symposium has been rated a great success. And plans are now under way to hold another in 2017. Staged in conjunction with Scottish Interfaith Week, this year’s event aimed to build bridges of friendship and trust while expanding interfaith trust. More than 60 delegates attended the opening lecture on “Abrahamic Religions Today” by Professor Hugh Goddard, Director of the HRH Prince Alwaleed bin Talal Centre for the Study of Islam in the Contemporary World at The University of Edinburgh. The second and third-day sessions attracted around 30 delegates each day. A Scriptural Reasoning workshop – Loving Strangers from Quranic and Biblical Perspectives – was led by Fadel Soliman, founder of the Bridge Foundation and Georgia and Owen May of the Rose Castle Foundation. A visit to Al-Maktoum Mosque was followed by distinguished researcher, Dirk Hartwig from the Corpus Coranicum in Berlin and the Centre for Islamic Theology, Münster, Germany heading a workshop focusing on Islam and Judaism. The day rounded off with a screening of the film, “Le Grand Voyages”, directed by Ismael Ferroukhi. The final day started with a lecture, “Muslim In Britain” by Dr Hafiaa Jawad, Director of the Centre for Islamic and Middle Eastern Studies at the University of Birmingham and afterwards there was a workshop examining “Islamophobia, The Far Right and The Media” led by Mohammed Ali Amla, founder of Global Village and Christian Muslim Encounters who is an expert in the areas of Christian-Muslim relations and Islamophobia. Delegates visited another local place of worship, St Peters Free Church, and returned for a talk, “Fighting The Hatred” by Mike Haines, founder of The Forgiveness Project, who has travelled the world, spreading a message of unity, tolerance and understanding since his brother’s death after being held captive in Syria for 18 months. The Peyman Heydarian Quartet brought the symposium to a close, performing Persian, Arabic, Kurdish, Turkish, Greek and Celtic Music. “We are both pleased and gratified that the symposium was such a success and the feedback from delegates has been extremely positive. “Our speakers were all excellent, the workshops were lively so, all in all, it has made us determined to hold another similar event at some stage in 2017. Professor Hugh Goddard, Director of the HRH Prince Alwaleed bin Talal Centre for the Study of Islam in the Contemporary World at The University of Edinburgh with College Principal and Vice-Chancellor, Dr Hossein Godazgar. 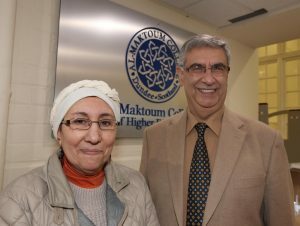 Dr Haifaa Jawad, Director of the Centre for Islamic and Middle Eastern Studies at the University of Birmingham with College Principal and Vice-Chancellor, Dr Hossein Godazgar. 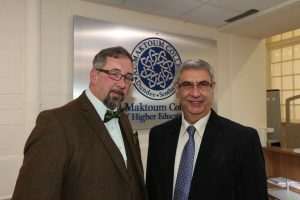 Mike Haines, Global Acts of Unity and founder of the Forgiveness Project, with College Principal and Vice-Chancellor, Dr Hossein Godazgar. Mohammed Ali Amla, founder of Global Village and Christian Muslim Encounters, with College Principal and Vice Chancellor, Dr Hossein Godazgar. 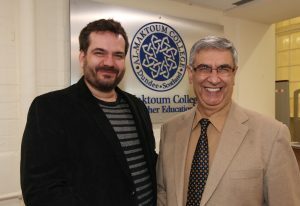 Principal and Vice Chancellor, Dr Hossein Godazgar with Mr Fadel Soliman, director and founder of the Bridges Foundation. Georgia and Owen May of the Rose Castle Foundation with Principal and Vice Chancellor, Dr Hossein Godazgar. Mr Dirk Hartwig, distinguished researcher at the Corpus Coranicum in Berlin and the Centre for Islamic Theology, Münster, Germany with College Principal and Vice-Chancellor, Dr Hossein Godazgar.